SALEM — Salem Farmers Market will be open, for its final run of the season, from 3:30 to 6:30 p.m. Thursday in the parking lot across the street from the Boneshakers Restaurant on East Pershing Street. Among the vendors planning to participate are Spencer Meats with frozen beef and pork, Newme Pies with homemade pies, James Natural Products with honey, produce and baked goods, Arika Jeans Farm and Cottage with jams, Garrett’s Garden with produce, pepperoni rolls and other baked goods and Ring Weaving Jewelry with homemade jewelry. 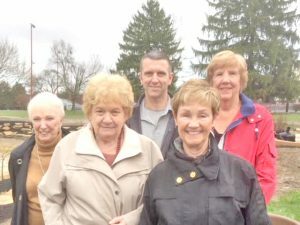 In addition to the vendors at the market, the Salem High School Class of 1969 Reunion Committee members will be present selling raffle tickets for gift baskets and also fresh, homemade baked goods. Classmates are urged to support this event as all proceeds will go to the 50th-year class reunion gift to the Salem High School Alumni Association Scholarship Fund. The Salem Farmers Market 2019 season will kick off in mid-June with the same day, hours and location. For information call 330-309-5884. SALEM — Veterans of Foreign Wars Post 892 Auxiliary is hosting a public breakfast from 8 to 11 a.m. Sunday at the post home, 496 Arch St. Haystacks, or a traditional breakfast of eggs, pancakes, hash browns, sausage patties and toast, are available. Cost is $5 per meal which includes orange juice and coffee. WINONA — Winona Area Historical Society’s 1838 Museum/Meeting House and 1895 Quaker Meeting House will be open from 2 to 4:30 p.m. Sunday. Both buildings are located at the corner of Winona Road and Cameron Street and are handicap accessible. Local memorabilia including military, flax scutching, school and business artifacts and pictures are on display. SALEM — Adele’s Place will sponsor the Banquet in Salem from 5 to 7 p.m. Monday at the Memorial Building, 785 E. State St. The menu offers stuffed chicken breast, mashed potatoes and gravy, applesauce, fresh fruit and vegetables and ice cream. Additional sponsors are needed. For information call Patty Colian at 330-831-2169. SALEM — The public is invited to a pancake breakfast from 6:30 to 11 a.m. Oct. 27 at the Concord Presbyterian Church on the corner of Route 45 and Calla Road. Cost is $7 and $4 for children 12 and under. SALEM — The Salem Saxon Club at 1980 Newgarden Road will hold its fall sausage sale pick-up day from 9 a.m. to 1 p.m. Oct. 27. Sausage sandwiches and coffee will be available to purchase. Rope sausage is available at $3.50 per pound in mild, garlic and hot. Available only in bulk in 3 or 5 pound packages is mild, garlic or hot. To order call Marilyn McNutt at 216-410-7291 or leave messages at 330-337-8940. The last day to order is Monday, Oct. 22. No deliveries are available this time. EAST LIVERPOOL — The East Liverpool Area Community and Learning Center will hold its fall expo on Oct. 27 at 110 Maine Blvd., next to East Liverpool High School. The public is invited from 10 to 6 p.m. In addition to food, the event features vendors, crafters, entertainment, music, movies, car show and art contest. CANFIELD — With the increased breaches of data security taking place across the country, Farmers National Bank is helping its customers and the community equip themselves with financial data security education through a series of seminars. The bank will host a business fraud protection seminar for area business leaders to discuss the insights, strategies and best practices for protecting their businesses against fraud. Seminars will be held from 7:30 a.m. to 9 a.m. Thursday at the Holiday Inn in Boardman and 11:30 a.m. to 1 p.m. Thursday at the Avalon Inn in Warren. The seminar will feature Stephen Bish, senior cybersecurity analyst for Schneider Downs, a top advisory firm providing assurance and technology business services. According to the 2018 Identity Fraud: Fraud Enters a New Era of Complexity report from Javelin Strategy & Research, in 2017, there were 16.7 million victims of identity fraud, a record high that followed a previous record the year before. Criminals are engaging in complex identity fraud schemes that are leaving record numbers of victims in their wake. The amount stolen hit $16.8 billion last year as 30 percent of U.S. consumers were notified of a data breach last year, an increase of 12 percent from 2016. For the first time, more Social Security numbers were exposed than credit card numbers. According to the Javelin study, account takeovers tripled in 2017 from 2016, and losses totaled $5.1 billion. “At Farmers, we are vigorously working to protect our customers from cyber threats through products and services, as well as implementing many industry best practices. But, just as important as our products and services, is the information and insight we can pass on to the business community at large. We’re excited to bring a security expert here to speak and share his vast knowledge on this ever-increasing threat,” said Kevin J. Helmick, president and chief executive officer of Farmers National Bank. The seminars are titled “The Vulnerabilities That Hackers Love to Exploit” and will cover a number of issues related to cybersecurity including the current state, common attached methods used and ideas to help an organization immediately. For information contact Amber Wallace at 330-533-3341 or farmersbankgroup.com. SALEM — Sites in the Salem area will be among 5,000 drop-off locations collecting shoebox gifts for children overseas during Operation Christmas Child’s National Collection Week, Nov. 12-19. Salem families, churches and groups are busy transforming empty shoeboxes into fun gifts filled with toys, school supplies and hygiene items. The Samaritan’s Purse project partners with local churches across the globe to deliver these tangible expressions of God’s love to children affected by war, disease, disaster, poverty and famine. For many of these children, it will be the first gift they have ever received. To pack a shoebox, mark it for a girl or boy for ages 2 to 4, 5 to 9 and 10 to 14; select a large “wow” item like a soccer ball or stuffed animal, then fill with smaller gifts (no toothpaste or candy) then wrap the lid and box separately. Beloit: Evangelical Friends Church, 18042 Fifth St., from 5:30 to 8 p.m. Nov. 12-16; 10 a.m. to noon Nov. 17; noon to 3 p.m. Nov. 18. Columbiana: Victory Christian Center, 350 state Route 7, from 9 a.m. to 1 p.m. Nov. 12, 13,15, 16, 17; 4 to 7 p.m. Nov. 12 and 14; 2 to 5 p.m. Nov. 18; and 9 a.m. to 1 p.m. Nov. 19. Lisbon: First United Methodist Church, 114 E. Washington St., from 1 to 4 p.m. Nov. 12; 2 to 5 p.m. Nov. 13 and 15; 1:30 to 5:30 p.m. Nov. 14; 1:30 to 5:30 p.m. Nov. 16; noon to 2 p.m. Nov. 17; noon to 3 p.m. Nov. 18 and 19. For more information on how to participate in Operation Christmas Child call 937-374-0761 or visit samaritanspurse.org/occ. BELOIT–West Branch Local Schools will celebrate another successful school year by hosting a free community pancake breakfast from 7:30 to 11 a.m. Saturday in the high school cafeteria. The meal is to praise the students, teachers and staff for their excellent work on receiving a “B” on the most recent Ohio Department of Education State Report Card. Members of the West Branch Levy Committee will be in attendance to answer any questions about the upcoming 0.5 percent earned income tax levy.